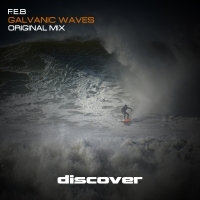 The latest tune from F.E.B, Galvanic Waves signals its intention from the start with a huge kick and bass that sends it straight into core of your soul - the place we like to call Discover territory. The dark vox adds to the intensity until the breakdown drops into huge chords with a scorching lead line that lifts the roof off the tune to perfection. Expect the unexpected as when it kicks back in, it's hoover stabs and driving bass and kick all the way - unrelenting and beautiful in equal measure.